The art of fishing hooks me. It gets my attention, lures me in, plays with me for a while, and catches me. I’ve been captivated by what lies beneath the surface of lakes, rivers, and oceans since I was a kid. It’s a whole other world down there, with all sorts of interesting creatures … and FISH. It’s the fish, and fishing, that got most of my attention when I was a kid. When would you feel that sudden tug on your line? Would you be quick enough to set the hook, or would that one get away ? And what would it be ? Trout, catfish, bass, perch, sucker fish? No! Not the sucker fish! Not the carp! Just the trout and bass, please. Sunfish, Crappie, and perch, OK, if they’re big enough to give a little fight. Ah. Fishing. Nothing keeps the little kid in you as full of expectation and adventure as much as fishing, if you got hooked by it, yourself, when you were little. It seems that folks have been feeling that way about fishing long before I caught my first trout. 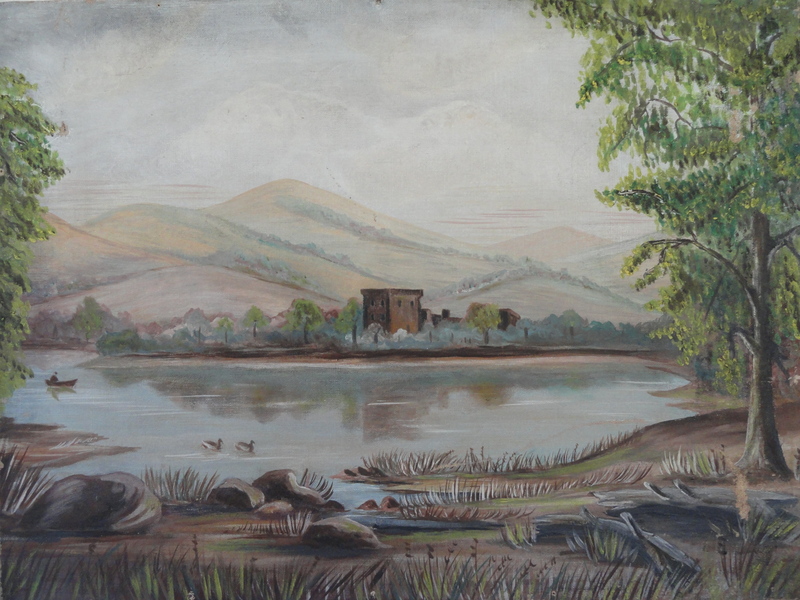 Here’s a painting of an Arcadian setting of the 17th or 18th century, showing a guy in a boat on the water, surrounded by rolling hills, a possibly empty castle, and verdant trees. What do you think he’s doing ? Fishing. That’s what I think. What else would he be doing ? Then there’s this guy, on some lake at the break of dawn, in this 19th century Hudson River school inspired painting on Academy board. What’s he doing ? Fishing , of course. Why else get up before the crack of dawn, just so that you can get your boat into the water before the fish start biting ? There is no other reason. Yes. This guy has the fishing bug, and he’s got it bad. 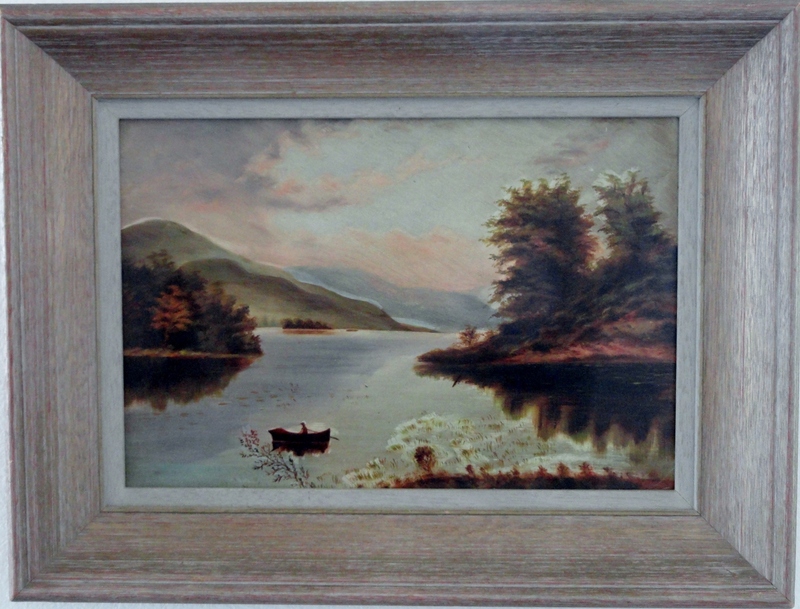 19TH century Hudson River School lake scene with man in row-boat. Paintings like these show me that there have been those that came centuries before me that were just as captivated by the sights and sounds and feelings and excitement of a fishing excursion, as I’ve been. I also notice that my nephew Josh has caught the fishing bug, bad, and is now taking his commitment to the next level. Fly fishing. Whew ! That’s serious. That’s a whole other Zen, meditative, A River Runs Through It, kind of level. But I think he can handle it. 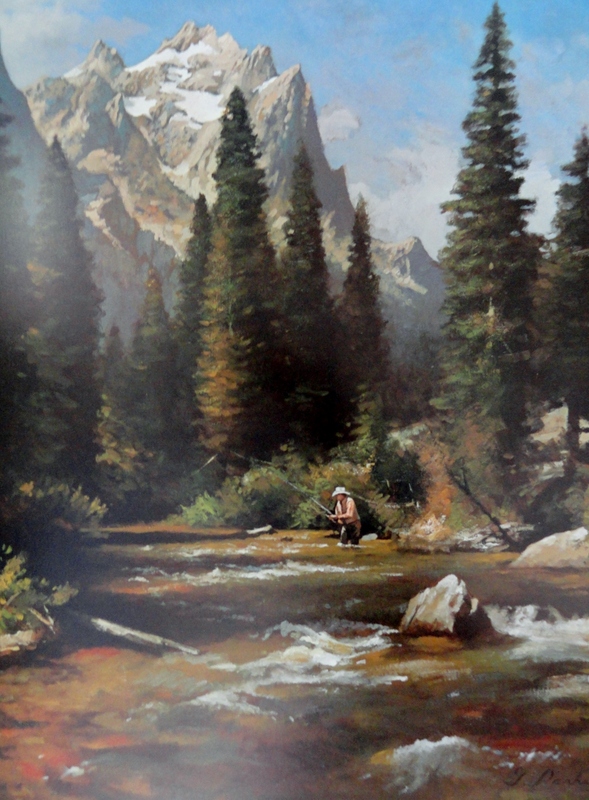 After all, what fisherman wouldn’t want to be the guy in this print created by Greg Parker in the 1980’s, titled FISHING THE TETONS. I don’t get around to fishing now, as much as I did when I was younger. So, paintings capturing moments that all fishermen can relate to capture my attention, instead. They bring back memories, and stir up the imagination. You become a kid again, looking forward with great anticipation to when a big lunker is going to break the surface of the water,and your line tightens up as your rod arcs forward towards the angling battle ahead. When you’re in that moment, there really is nothing better. I am reminded of The Complete Angler and all of the descriptions of the book–about the art, science, love of, spirit of, prose & poetry of fishing–to name a few! It’s nice when a pastime can bring such good memories, and good that your nephew is showing an interest. You two can have meaningful conversations about your experiences and perhaps share a time or two fishing together.